We looked into each others eyes and I instantly felt the connection. Be damned you evolution deniers, I can see with my own eyes that we are related. I could tell that she trusted us as she let her baby wander around freely. We had been like this for hours and I knew soon we would have to leave. It would be hard to say goodbye, who knows when we’ll see each other again? Thus begins my love affair with Mina, an Orangutan that has allegedly bitten over a thousand humans. 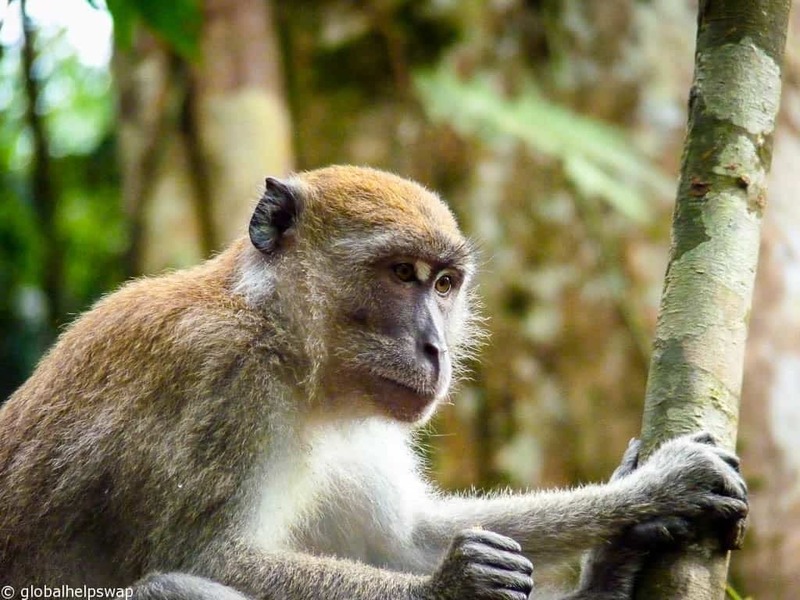 Gunung Leuser National Park is in Northern Sumatra, Indonesia. 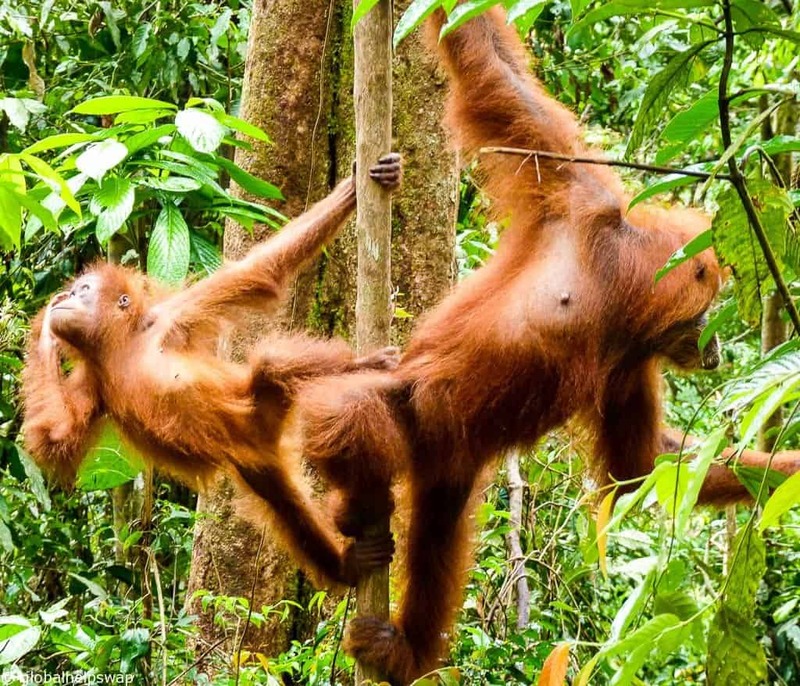 Along with Borneo, Sumatra is the only place in the world where you can see Orangutans in the wild. The park is over 150 km long and 100km wide and is mostly mountainous. Along with the Orangutans, the park is also home to Sumatran Elephants, Sumatran Tigers, Sumatran Rhinoceros, Leopard Cats and much more. But we came to see our red cousins. For as long as I can remember, the Orangutan has been my favourite animal. Is it because I am hairy and have red in my beard? Who knows. When I knew we would get to see them in their natural environment, I was bursting with excitement. 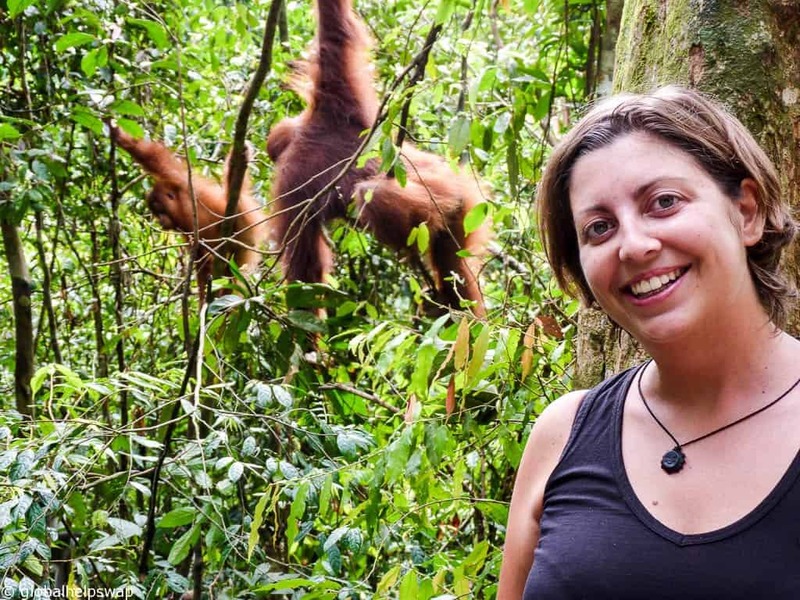 Gunung Leuser National Park is a great and easy way to see Orangutans in the semi-wild. Most of the Orangutans were released into the park in the 1970’s and 1980’s. The now closed rehabilitation center was originally opened in 1973 by two Swiss zoologists, Regina Frey and Monica Boerner. In 1980 the Indonesian government took over and kept it in operation until 1996. In that time over 200 captive Orangutans were released into the park. 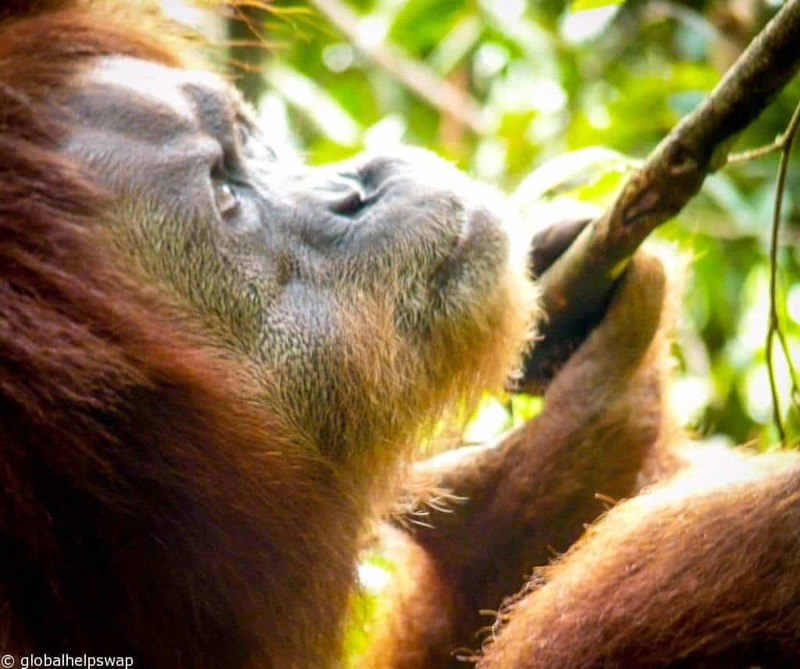 The centre can no longer operate as the area already has enough Orangutans, plus releasing ex-captive Orangutans where wild Orangutans live also risks importing disease. However, there is still a daily feeding program, where you will get to witness these incredible animals up close. We ended up going twice to observe the Orangutans as the first time we went was a Sunday and it was very crowded and noisy. Why do people go to observe wildlife and then make constant noise as they do so? Our tip is to go in the week where it will be less crowded. 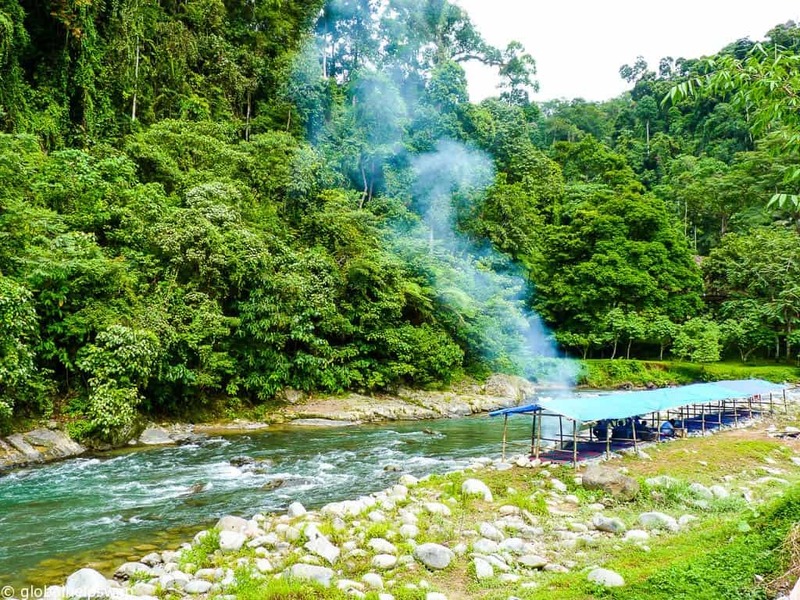 You will be staying in the nearby village of Bukit Lawang, an interesting place in its own right. There is various accommodation options in the village and the park is just minutes away across the river. On our second visit to the park there were only 4 of us and the rangers let us stay longer. Along with swimming with Whale Sharks in the Philippines this was the most magical experience we had in our 18 months on the road. To be able just to sit and observe these beautiful animals up close will live with me forever. The day starts by walking to the viewing platform which is across from the feeding station. The ranger starts to bang a large rock on the wood to let the Orangutans know it’s breakfast time. I will never forget seeing that first flash of red high up in the trees as the first Orangutan appeared. Orangutan’s are incredibly polite. 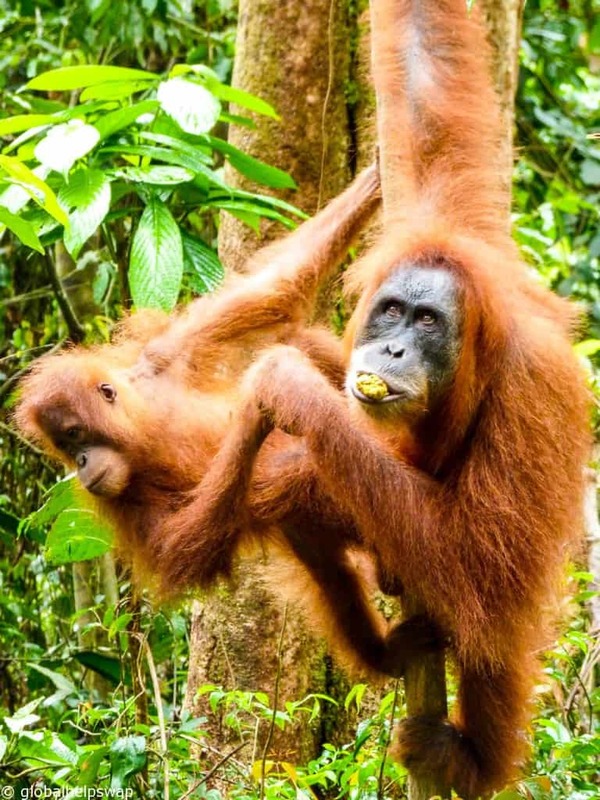 Each Orangutan waited patiently in the trees whilst one by one they ate their food. When the Orangutan left the feeding platform, the next one would climb down. That was until Mina turned up. Mina didn’t climb down from the trees to bed fed. Oh no, she nonchalantly walked through the viewing platform area to get to the feeding station. It was almost as if she wanted to show us that this was her jungle and she was the queen. As an infant Mina was trapped and kept as a pet. She probably witnessed her Mother being killed as she was being trapped. Imagine what that felt like? Orangutans share 96.4 % of our DNA and are highly intelligent animals. Orangutans stay with their mother until 8 years old as there is so much to learn from their Mother’s about life in the forest. So Mina like many others was left an Orphan. She was kept as a pet for 3 years before she was taken to the rescue centre in Gunung Leuser National Park. 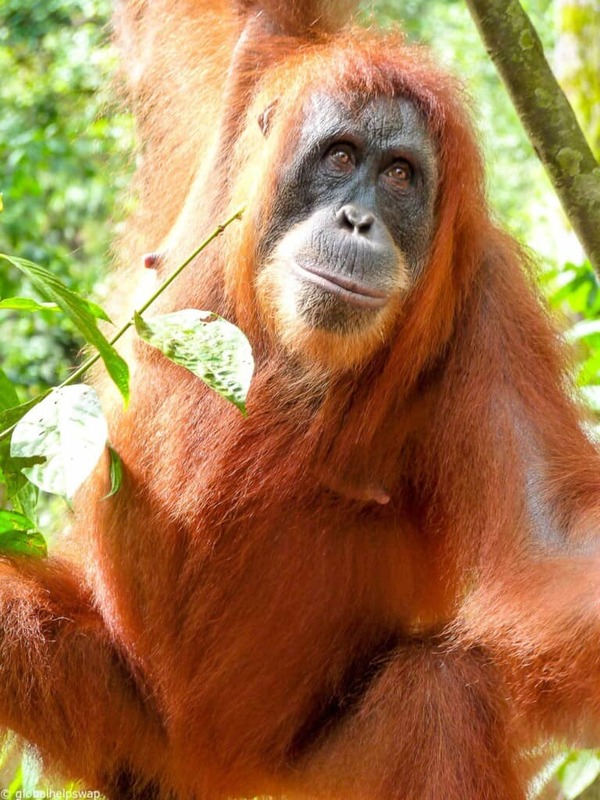 While one of the Centre’s workers tended to Mina, the young orangutan tore off her tank top and tried to suckle the woman’s breast. When nothing came out, Mina bit the woman’s breast off. This is how hungry she was. It is a horrific tale, the poor woman was just trying to help Mina but Mina was so hungry she acted instinctively. Her suffering didn’t end there. Once a guide to the park tried to impress female tourists by mocking Mina. She choked him nearly to death and bit his shoulder. 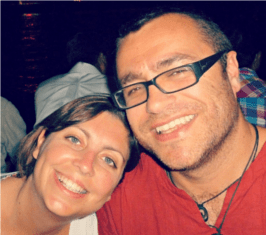 Two weeks later, the man headed into the jungle with a machete, intent on killing her. For three nights the man hunted her, but she hid. Mina isn’t only smart, after years of abuse by humans she can sense what we are thinking. The authorities once tried to move Mina deeper into the jungle. They blew two tranquilizer darts into her skin to sedate her but she ran off into the Jungle before the sedative could kick in. What a girl! In the end the authorities gave up and let her stay. For that I am forever grateful. Who knows why she sat with us for so long that day? I am hoping she could sense that we meant no harm to her and her baby. As we got up to leave, I gave one last look into those beautiful brown eyes and knew that she would always have a special place in my heart. Getting there: Medan has the nearest airport. To get to Bukit Lawang you can either take a long bus which takes 3/4 hours and should (but ask) depart every 30mins. Or you can take a minibus which will take less time as they drive like maniacs. 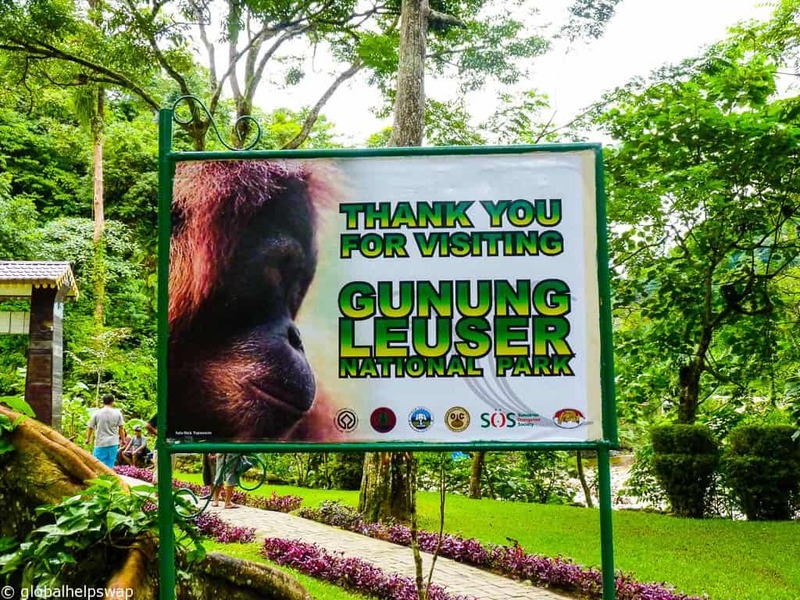 Fees: Permits need to be arranged at a Gunung Leuser National Park office before entering the park. The fee is Rp 150,000,- (foreigner) and Rp 5.000,- (Indonesian) per person. Opening Times for the feeding station: Feedings are daily at 8.00AM and 3.00PM. Accommodation: There are various guest houses in the village. Try to stay in a locally owned and run places as the money goes directly back into the village. Orangutan Interaction: It is forbidden to touch, feed, or disturb the animals – there is a high risk of disease transfer due to the close relationship between humans and orangutans. Unauthorized feeding is also prohibited, as it discourages the semi-wild population from reducing any dependence on humans and becoming free-living in the wild. 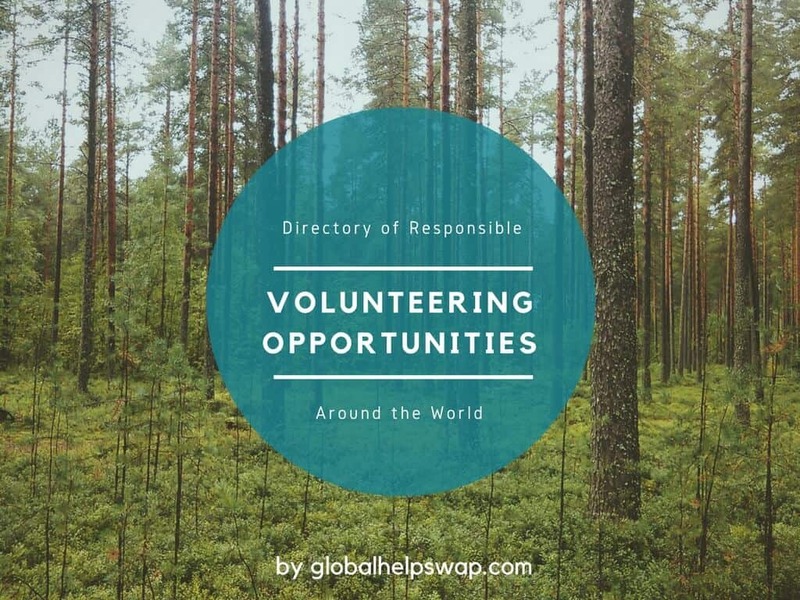 SOS works to find local, national and international solutions to the root causes of deforestation. 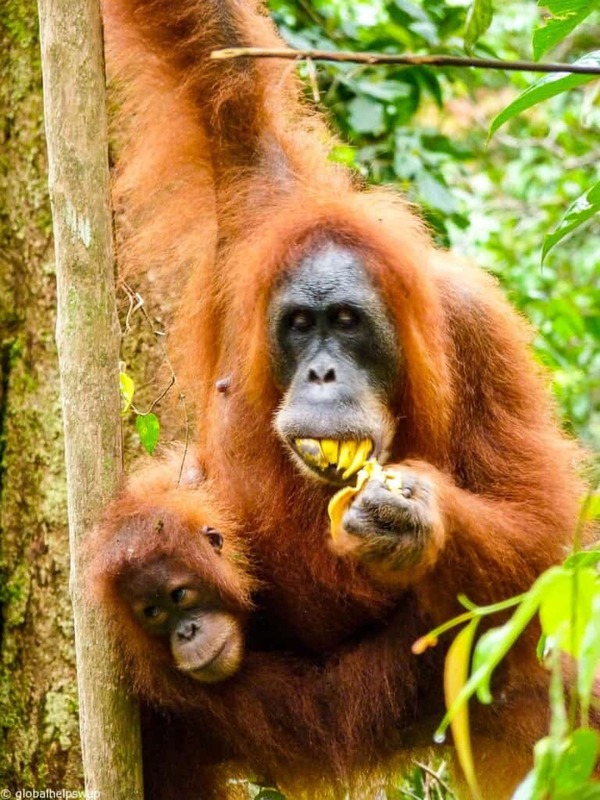 Their ultimate aim is to protect, extend and secure the habitat of wild orangutans to stabilise and grow the population. 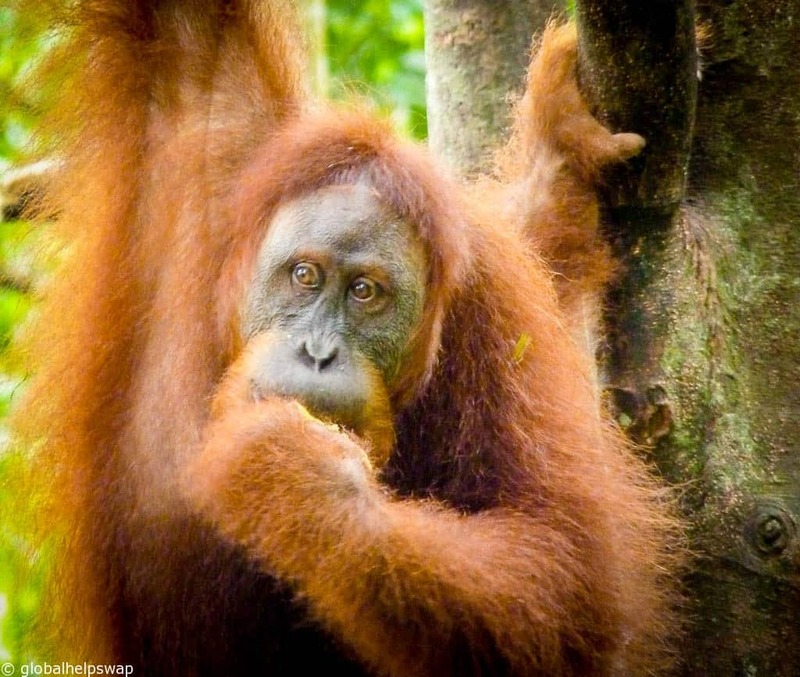 Please donate to SOS now and help try to rescue the Orangutan before it’s too late. Hi Shivya! Thanks for the comment. It was magical. Hi, excellent article. However, I was there week before last and since you wrote this, the feeding platform has been closed indefinitely. The official line is the boat across the river is out of action but from talking to locals it sounds more like the parks service are pulling out to make the Orangutans less reliant on hand outs. The Orangutans are still viewable but only on guided treks. Thanks so much for the comment and updated info. At least they have stopped it for a good reason. Good old Mina! No, we tell people to avoid Oslob because the guides feed the sharks and there have been pictures of people riding them. No, we went to Donsol which was amazing.